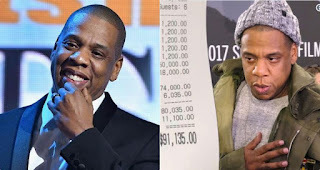 Jay-Z had one expensive night out in Manhattan on Sunday, dropping more than $110,000 to celebrate the birthday of Juan “OG” Perez, his close friend and president of Roc Nation Sports. 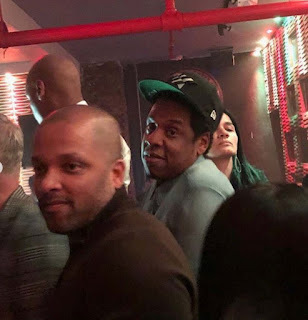 Jay skipped the All-Star game to take OG Juan and a group of Roc Nation execs to Zuma in Midtown for dinner, picking up the tab of $13,000. Then, the group headed uptown to Made in Mexico in Inwood, spending $9,000 on drinks, including Jay’s D’Ussé cognac, followed by a stop at nearby nightclub Playroom, where — even though they were, by this point, down to a group of six — they ordered and paid full price for 40 bottles of Ace of Spades Champagne, which is owned by Jay. The rapper was seen handing bottles out to other tables in the club. The stunned Playroom server posted Jay’s check on Snapchat, which came to a whopping $91,135, which included an epic $11,000 tip. The receipts show that Jay Z and his friends spent a total of $91, 125 on drinks in one night at PlayHouse club. When you do the conversion to Naira, that’s about N32M. Yes, guys, that’s how much money was spent drinking. 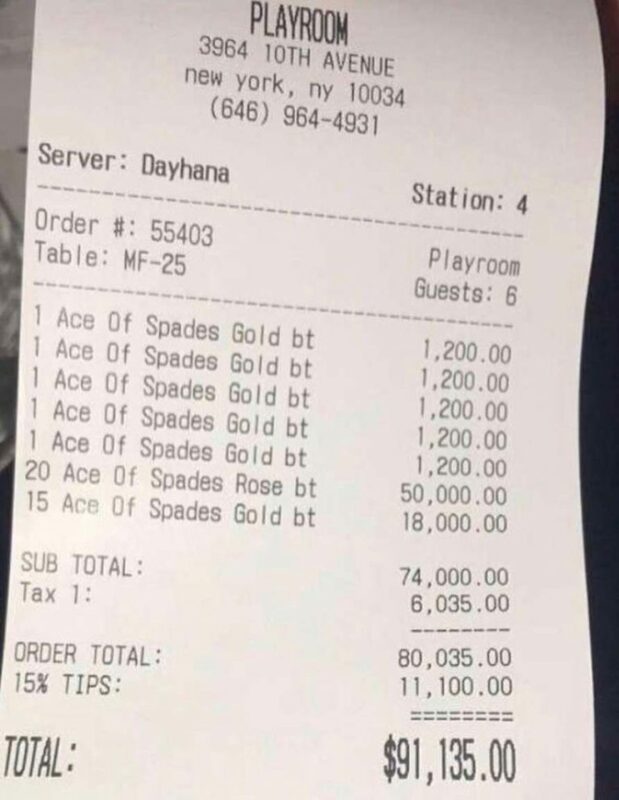 Pictures of the receipt show that these guys bought a lot Ace of Spades which interestingly is owned by Jay Z himself which means he gets to keep his money. Wise move right? 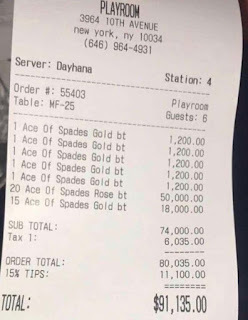 Now if you take a close look at the receipt, you will see that the waiter who served the drinks by the name, Dahyana got a tip of $11,000 which when converted to naira is about N3.9M. Imagine earning that kind amount of money in one night! 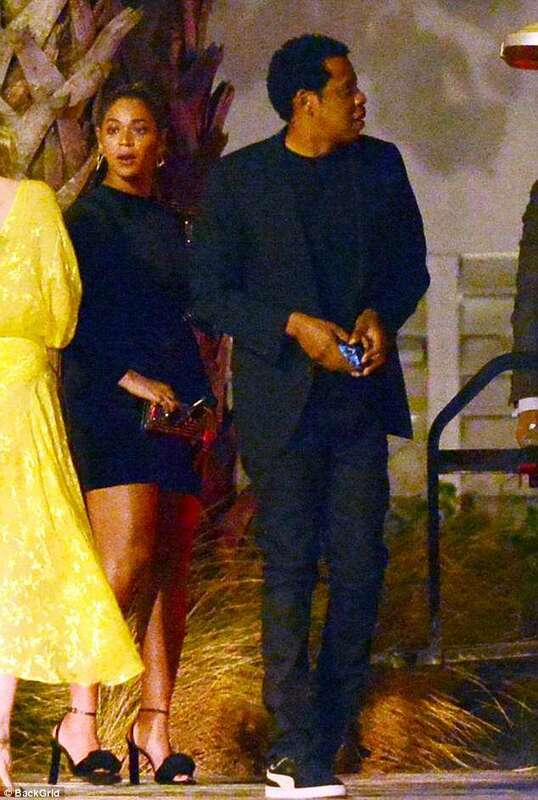 Like we all know Jay Z isn’t your ordinary celebrity so it is okay if he decides to spend any amount of money on drinks. Jay Z is married to the beautiful superstar, Beyonce and they are blessed with three beautiful children including a set of twins. Even though their marriage was recently rocked by infidelity allegations, they were able to put it aside and move on.